Why are we likely to live longer than our great grandparents did? Modern medicine gets much of the credit for our longer life spans, but there is something else that deserves just as much credit: our modern water system. 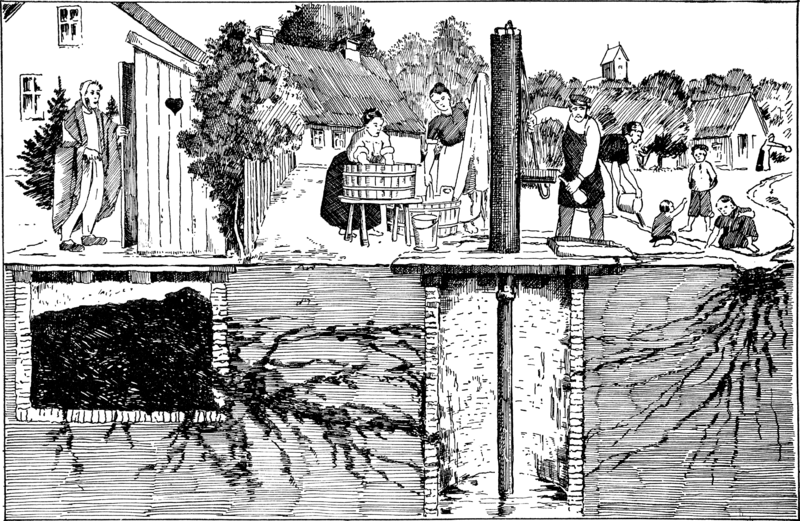 This illustration was created to educate villagers in Europe about the need to seperate out houses and cesspits from wells. Everyone knows that we didn’t always have indoor plumbing, but we rarely think about how much safer our water is when it comes out of our tap. We didn’t always have the ability to clean our water and test it to make sure that it is safe. Before the 20th century people died regularly from diseases like cholera, dysentery, and typhoid – often caused by tainted drinking water. All of these diseases infect the intestines and are caused by drinking water or eating food that has come into contact with the feces of an infected person. They thrive in places where waste is not properly separated from water. The old etching above was created to educate village people in Europe about how the disease spreads – if a well is located too close to an outhouse, it can become infected and the disease will spread through the population. These diseases are still found in developing countries around the world, where people do not have modern sewer and water systems, or they are not able to properly take care of them. Why Do You Have a Sewer and Water Bill? The answer to that question goes all the way back to the birth of the modern city. When people from the countryside started moving to cities in search of factory jobs during the Industrial Revolution, many brought their old ways of life with them. They dug wells and outhouses near their dwellings. Understandably, as more and more people started crowding into tighter spaces, disease started to spread rapidly. While some cities had rudimentary sewer systems (often built out of hollowed-out logs) they had no way of treating the water to ensure that it did not poison the drinking water supply. In 1884, the citizens of Chicago were probably very proud of their modern sewer system. They had raised the level of the entire city 10 to 15 feet to allow sewer lines to flow down into the Chicago River, which at that time drained into Lake Michigan. Unfortunately, Late Michigan was their source of drinking water, and in 1885 an unusually bad storm flushed the contents of the sewers out past the intake lines for the city’s drinking water. A typhoid and cholera epidemic swept through the city killing between eleven and thirteen percent of the population. Later, Chicago’s citizens decided to build a Sanitary and Ship Canal, which essentially reversed the flow of the Chicago River. Sewage then flowed into the Mississippi River, polluting the drinking water of the City of St. Louis – more than 350 miles downstream. The Clean Water Act now requires that we have sewage treatment plants to disinfect what we flush down the toilet. There are strict rules that limit the level of bacteria in the water that is allowed to go back into the environment, and agencies must test it regularly. Similarly, the Safe Drinking Water Act sets strict rules about what water agencies must do to make sure that our tap water is fit to drink – they are even stricter than the rules bottled water companies must follow. The centralized systems, with treating and testing both drinking water and wastewater (what you flush) is all covered by your water and sewer bills. Your water agencies work like a business in that they survive off of the proceeds from their service, but unlike private companies, they are not in business to make a profit. That allows them to focus the money you pay solely on providing the best possible service to their customers – you.